16 April - I had hoped to get a few more newt egg photographs taken by now - perhaps I'll get some done this evening. Back on the 4th I was commenting about the presence of young newts, complete with external gills on the plants being used by the adults for egg laying. Today I have been doing a bit of work away from the pond, by the metal shed. In the process of moving around some paving stones I started to move some small stones that were tucked in a corner. That process stopped as soon as the first stone was lifted to reveal three very small newts that had been hidden underneath. 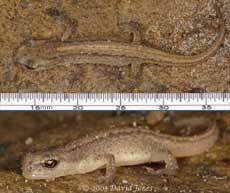 Measuring rather less than 3.5cm in length, these are exact replicas of the adults, and complete with nostrils rather than external gills. I deliberately photographed this one on the stone it was found on so that you can see how well its colours blend in from the top. Once you look from the side you can see the much lighter underside that I assume will act as counter-camouflage when swimming in a pond. When first uncovered their reaction was to play dead rather than head for cover. I picked this one up using a leaf and it didn't move at all, keeping its posture very stiffly. Once it was put back down and left alone for a minute or so you could just see its head move as it reacted to the movement of my finger near it, before it finally became active. The fact that there is little difference in size between these and the gilled newts I see in the pond makes me wonder if they are all offspring from last year. To answer my question of the 4th, it will be another two years before they are sexually mature and ready to add to our newt population. The little stone pile is now going to stay put and be protected. It is obviously a desirable residence for young newts so I shall be planning around it in the future! I managed to look at just one newt egg this evening and, although it repeats a stage photographed already, this time I have managed to get in closer to get these three views of the same egg. They show quite clearly the neural folds gradually enclosing the darker neural plate to form a tube, with the front end still open. The opening is known as the neuropore at this stage. As this closes the brain will start its development, while the neural plate in the rest of the tube will become the spinal cord - an amazing process! 17 April - Today again I spent time organising things by the shed, this time putting in a step to replace a sloping bit of path. No newts spotted today (I didn't disturb the stone pile) but a tiny frog made an appearance - obviously one of last year's brood. By the time I fetched my camera it had hopped away. I only spent a short time watching the happenings at the pond today. 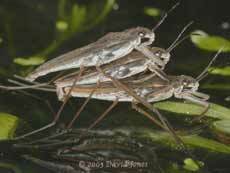 There were newts egg-laying, but this time I concentrated on a pair of Pond Skaters that were mating. In this first shot you can see that the female is busy feeding on a dead solitary bee. 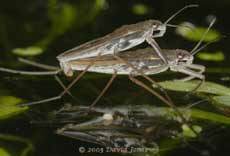 Her partner was keeping very still until he started bobbing up and down vigorously and seemed to be jabbing at her with his rostrum (sucking mouth structure). This only carried on for a few seconds before he became still again. 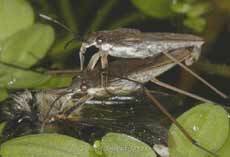 The pair were being pestered by another pond skater, and the female eventually stopped feeding and the pair moved away from the fly. The third (male) skater followed them and suddenly jumped up on top of the pair and in the picture appears to be 'arm wrestling' the male that got there first. Moments later the three 'skated off' in different directions and hadn't met up again when I left a couple of minutes minutes later. 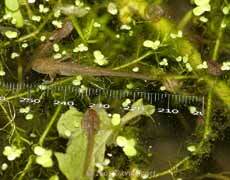 19 April - A picture from last night - the longest 'juvenile' newt I've seen. This one, at 3.7cm, is bigger than the newts I found by the shed a couple of days ago. I'm beginning to wonder about our newts. On the BBC website it states that some Palmate Newts can can retain their juvenile characteristics even as mature adults (a state known as neotony). I can only find vague references to the same thing happening in Smooth Newts, although I could be wrong. I've always assumed that our newts cannot be Palmate Newts because I couldn't see their webbed feet. I have wondered about their ID as Smooth Newts should have spotted throats, and this isn't obvious on those pictures I've taken of the females egg-laying upside-down. Perhaps we have a mixture of Smooth and Palmate newts?? 27 April - Sorry about the gap! The pond is getting very crowded now, as the plants thrive. 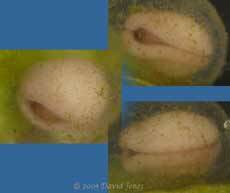 I am still seeing newts egg laying, although not as much now. This first image is the closest I've got yet to an egg in its early stages of development. The only signs of development that I can see on it are feint shadows. This next embryo is much more advanced. You can see the ridge along the back where the neural folds have closed over the notochord, a process that doesn't appear to be complete at the front end (the dark area in the lower image). In the large image you can see a series of bands that cross the ridge. These show the positions of what are called myotomes, from which body muscles will develop. 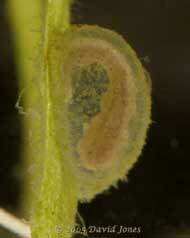 Back on the 15th I took this picture of two eggs that, unusually, were laid next to each other on a leaf. 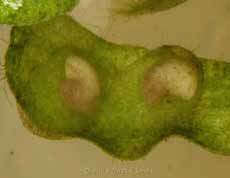 Slightly fuzzy images, they show that the embryos were still fairly early on in their development. Today I photographed them again. Now, development is much more advanced and they have grown quite a bit in size. Also, their muscles are now starting to work. 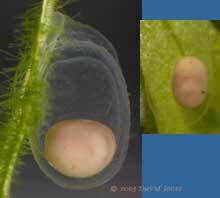 The two pictures were taken just a few seconds apart and show that one embryo has turned around within the egg. 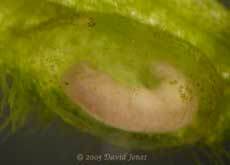 This image, looking 'down' onto the back of another embryo shows how the external gills are developing. 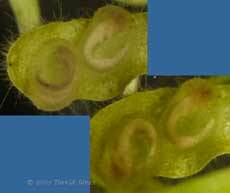 Finally, this image is included,not for the embryo itself, but because it shows the presence of an even smaller insect embryo which appears to be feeding on the surface of the egg. 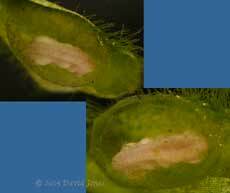 To give an idea of scale, the egg measures about 3mm across. 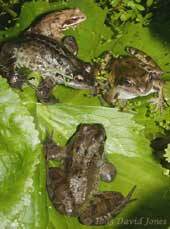 30 April - Today it was warm and humid, conditions that seemed perfect for the frogs in our ponds and garden. There must have been 40-50 (or even more!) of them in or around the edges of the two ponds, mostly in groups like this one on Marsh Marigold leaves, notice the juvenile. One of the groups had at least sixteen frogs in it, although its position meant that I couldn't get a decent photograph. 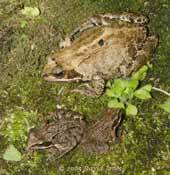 This second image shows three individuals on a stone in the small pond. I have never seen so many juveniles out in the open here before. It really is encouraging for the future. Even with all the frogs around the pond I still came across others in other parts of the garden, hidden under stones, or in one case in the water that fills a tray under a plant pot! Apart from the great display of frogs, I saw our first damselfly of the year this morning. Its red abdomen suggesting that it could have been a Large Red Damselfly.